Listen to the Divine Mantra of Bodhisattva Avalokitesvara. Avalokitesvara Bodhisattva, known as Kuan Yin to the Japanese and Chinese, can be depicted as male or female. 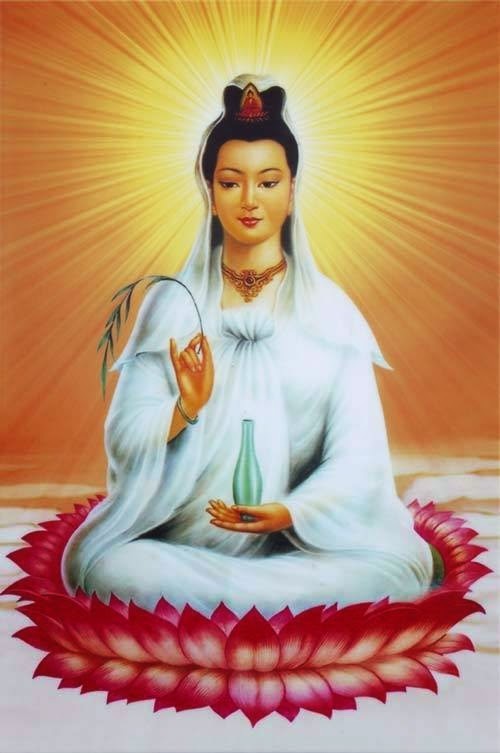 Kuan Yin, "Regarder of the Cries of the World", is sometimes thought of in the West as a Goddess of Mercy. Her compassion for all beings is vast and inconceivable. Her body and garments are of brilliant, translucent white light. She carries a white vase of compassionate water in her left hand and the sacred willow branch in her right hand. Enlightened through infinite acts of compassion, in countless lifetimes, her feet rest upon a fragrant red lotus flower above a vast ocean. Her brows are curved and radiant like the crescent of an autumn moon. With the sweet dew drops she sprinkles from her vase she relieves the suffering of beings everywhere and always - for countless autumns. Kuan Yin appears in different forms in religions around the world. What she embodies is the power of compassion that rests in the heart of each one of us. If you have never listened before to Imee Ooi please try it now - it is special!